Many of the classic recipes of Brazilian cooking have a counterpart in other cuisines, be it French, Italian, or American. For instance, feijoada, the famous Brazilian concoction, could be described as a type of cassoulet using different kinds of meat, and black beans instead of the French Tarbais. Other dishes are a bit hard to “explain” for those who are not familiar with it. Farofa is one perfect example. The closest culinary item that I can use to describe farofa would be the toasted rice powder used on larb. It’s about texture. 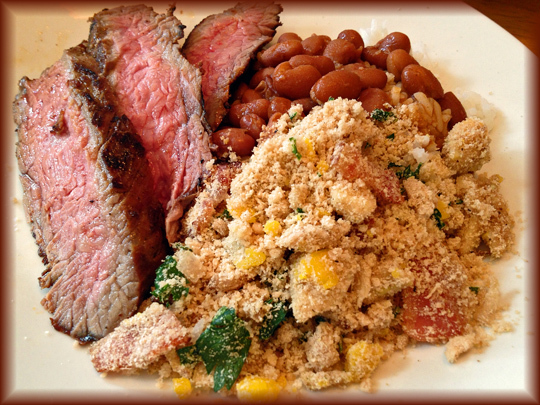 Just like Bolognese sauce and chili, each Brazilian family will swear by their recipe. I will give you my own family version, the one that Phil fell in love with the first time he’s tried it. Cook the bacon on low heat on a large, non-stick skillet. No need to add any oil, the bacon will release its own fat. Once the fat starts to accumulate in the pan, increase the heat slightly and allow the bacon to get some color. Add the butter and the diced onion, cook over medium-heat stirring often until the onion gets light golden. Add the garlic, cook for a minute, then dump all the manioc flour. Season with salt and black pepper, and keep stirring until the flour starts to get toasted. Make sure to stir the flour from the top to the bottom of the pan, so that the whole amount gets cooked. Remove the pan from the heat, add the hard-boiled eggs and the parsley. Serve warm or at room temperature, preferably over a nice helping of white rice and beans. Comments: If you want to make this Brazilian delicacy, it’s absolutely essential to find the right type of manioc flour. It is NOT the fine powder used to bake items such as Brazilian cheese bread. The manioc flour used for farofa is coarse, and sold in two different forms: white and toasted. You can use either one for this recipe. If you start with the toasted flour your farofa will have a slight more intense flavor. To order some online, click here. I really like Yoki brand, you can get “cruda/crua” (white) or “torrada” (toasted). 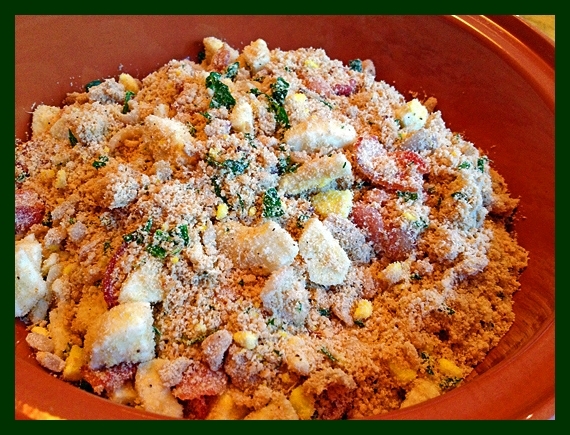 For a delicious farofa variation that includes corn, visit Angela’s blog (in Portuguese). I intend to make her recipe soon. Farofa is best enjoyed over black beans and rice, or a nice moqueca. Anything with a spicy sauce only gets better with a nice coating of farofa. But, I must say that once you get hooked on it, you will find yourself reaching for the bowl with a spoon and enjoying it all by itself. Gotta tell a little story here. My Dad was the utmost farofa-lover. He developed a very interesting skill to enjoy it, in which he grabbed a fork, balanced a big load of farofa on it, then launched it up in the air, catching it all with his mouth! Believe it or not, not a single crumb would fall on the floor… It’s really too bad in those days cell phones with camera did not exist or he could have been be a super-star on youtube. It’s ok, though. He was and will always be a super-star for me.